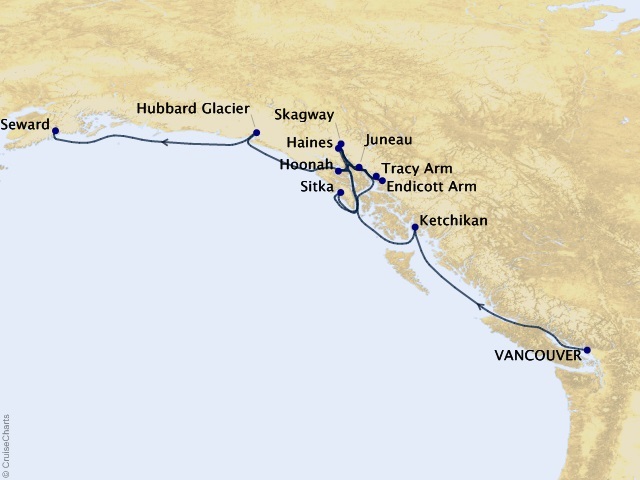 Hoonah's founding people, the Huna Tlingit people, originally occupied Glacier Bay, but relocated due to advancing glaciers into the city's current place along the Inside Passage. Tall evergreens cover the mountains along the coast, and across the Icy Strait twenty-five miles north is Glacier Bay National Park, one of the seven small wonders of the world. Hoonah is a prime location to view birds and wildlife, as it hosts the largest brown bear population in the world, in addition to opportunities to view bald eagles and humpback whales. Alaska's heritage comes alive in the handcrafted artistry of the Tlingit Indians and in the lively performances of the Chilkat Dancers, with their brightly painted tribal masks. Get a glimpse of the town’s gold-rush history in local museums. Visit the Chilkat Bald Eagle Preserve—Haines boasts the world’s largest concentration of the magnificent birds, drawn to the area by the salmon-rich waters. Take a boat trip on Lake Chilkoot or a glacier country flightseeing trip. Located about 45 miles south of Juneau, Tracy Arm, a classic fjord located in the heart of the Tracy Arm-Fjords Terror Wilderness, stands out as a "must see" for any Alaska vacation. The icebergs are framed by sheer mountain peaks reaching to 7,000 feet. Waterfalls flow from ice covered mountains to the jade colored inland sea. Tracy Arm is the summer home for pigeon guillemots, kittiwakes and arctic terns. Usually mountain goats are seen on the rocky slopes near Sawyer Glacier. They have been known to come down near the water. The best bear viewing is along the shores of Stephens Pass or Holkham Bay, and there are whales and seals. Endicott Arm, a 20-mile long fjord, has been compared to Yosemite with sheer granite cliffs, waterfalls and breathtaking mountain peaks. Less travelled than Tracy Arm, but just as spectacular. Seward and its surroundings comprise a land of memorable beauty--saltwater bays, blue glaciers, majestic mountains and alpine valleys. Located on the Kenai Peninsula at the head of Resurrection Bay, the city is one of Alaska's oldest communities, and also one of the most scenic. Cruise port, security and handling fees of $600, transfers, airfare, government fees and taxes are additional for all guests.